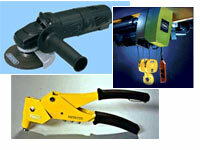 Industrial Tools and Accessories from Tools For Industry, Inc.
Rebar Cutter and Bending Equipment. Tools For Industry, Inc. carries a wide range of industrial tools and accessories. The following represents a partial list of the pneumatic tools that we offer for the general construction industry. Additional pneumatic, hydraulic and electrical driven equipment can be accessed through our home page, search feature or indexes to the left.